Brining your bird before cooking it is the best thing that can happen to a Thanksgiving turkey. I am a firm believer in the brine and no longer roast any poultry without brining it first. So the next logical question most of you are asking is what is a brine and what is so good about it? Whether you are willing to admit it or not, every one of us has fallen victim to a dry turkey at some point in our lives. Brining is the solution to that problem. 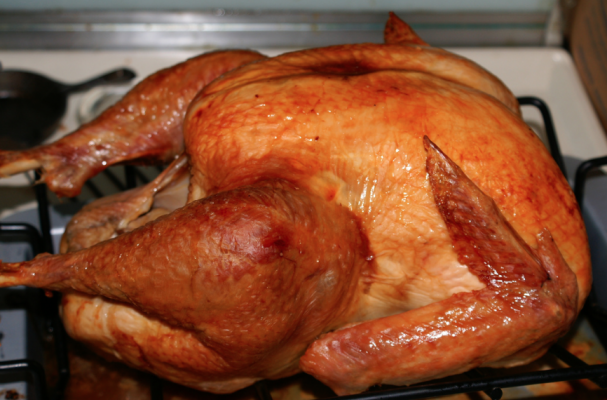 It helps the bird retain moisture and enhances the turkey's natural flavor while roasting. There are two ways to go about brining a turkey: wet and dry. The wet version is the more popular of the two methods but is also the messiest. It involves soaking a turkey in a salt water bath along with some herbs, spices, and aromatics for at least 24 hours prior to roasting. I find the dry method to be much simpler. I want to make my Thanksgiving prep as easy as possible and a dry brine helps me accomplish that. A dry brine works in much the same way as a wet brine but without the hassle. The bird is coated in a seasoned salt mixture and left overnight in the fridge. Without getting into too much detail about the science of it all, a dry brine helps the turkey retain more of its natural moisture without watering it down with liquid (i.e.plumping the bird with water). This process yields a more flavorful and juicy bird, and in the end that’s all we really want. In short, a dry brine is the easiest way to get a tastier Thanksgiving turkey. To start, you will want to pat down your turkey with a paper towel so that it is mostly dry. Next, you will want to generously salt the bird by sprinkling the granuales about 5 to 7 inches above the bird. I use a combination of kosher salt, poultry seasoning, and freshly ground black pepper but you can just use plain salt as well. I have found that 1 tablespoon of kosher salt for every five pounds of turkey seems to be a good ratio. If you are a fiend for crispy skin, add a teaspoon of baking powder to your seasoning mixture. This little trick helps to evenly brown the skin and adds amazing crunch. Let the turkey sit at least 12 hours before roasting (preferably 24) and then proceed with any additional seasoning you might want to add. Warning: do not add any extra salt to the turkey after the dry brine. The video below is from the gals over at Food 52 and gives you a visual on what I have explained above. Do you brine your turkey? Which method do you prefer? Let us know your thoughts in the comment section below.